Weekend Historical Happenings: 8/18/12 - 8/19/12 ~ The History Girl! Send me an email to let us know! Wayne Historic House Museums will be presenting the annual Terhune-Sunnybank Exhibit and Sale at the Van Riper-Hopper House Museum at 533 Berdan Avenue on Friday, from 12:00 - 3:00 pm and Saturday from 1:00 - 4:00 pm. Visitors will enjoy an exhibit featuring the ever-changing responsibilities of war dogs in World War I, World War II, Vietnam, and Iraq and Afghanistan depicted through photographs, books, postcards, and newspaper articles. Albert Payson and Anice Terhune contributed to supporting the courageous war dog efforts during World War I through war dog stories, including true exploits. In addition, the exhibit will be displaying and selling a selection of Sunnybank photographs by Laura O'Connor of Andes, New York taken between 1966-1968. Admission will be a free-will donation. Proceeds benefit the Wayne Historical Commission and its support of the Wayne Historic House Museums. For more information call 973-694-7192 or visit www.waynetownship.com. Enjoy demonstrations from a tinsmith, a blacksmith, tin piercers, and a metal jewelry artisan at the Cooper Grist Mill in Chester on Saturday between 1:00 and 4:00 pm. Try tin piercing and make a tin-pierced ornament to take home. Learn the reasons why these skills were important to colonial people. Donations appreciated. The Cooper Grist Mill will also be open for tours. The last tour is at 3:30. The Cooper Grist Mill is located at 74 County Highway 513 (Old State Route 24), Chester, NJ 07930. 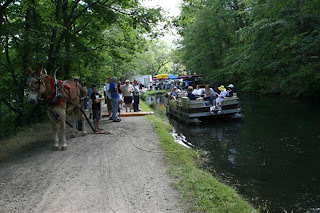 The Canal Day Festival is an old time country fair that celebrates the Morris Canal and its contributions to the communities along its banks. The day includes 12 musical artists, kayak and mule-drawn boat rides, historic walking tours, blacksmith demonstrations, pony and hay rides, Wallaby Tales Traveling Zoo, a craft and arts show, food and fireworks. The event is held rain or shine at Hugh Force Canal Park, 170 West Central Avenue, Wharton, NJ. The event runs from 10:00 am - 4:00 pm. Fireworks begin at 7:00 pm. For more information and a schedule of events, visit http://www.canalday.org. "Casting for the War Effort"
Ever wonder where all the cannon balls and bullets behind the bloodshed of the Revolution came from?Did you know Hunterdon County was once rich in forges, mines, and foundries? In Revolutionary War times the quaint community of Clinton was harshly divided. Families, neighbors, and friends were torn apart by allegiances sworn to King James the III or to the Thirteen Colonies! On Saturday come hear the story behind the forging of the bullets that won the war and learn more about the history lurking in your backyard! John Yates will present an introduction to genealogy for beginners to intermediates, including getting started, keeping records, using computer programs, and researching local, county, state, and federal records at the Tuckerton Historical Society. It will be held at the Giffordtown Schoolhouse Museum, 35 Leitz Blvd., Little Egg Harbor. Call 609-294-1547 for more information. Program is held from 2:00 - 4:00 pm. While not the first First Lady, Dolley Madison helped define the role for future White House women. A charming woman possessed of social savoir-faire, she served as First Lady not only with her husband, James Madison, but with his predecessor, widower Thomas Jefferson. On Saturday, August 18, Mrs. Madison herself will appear in person at Paterson's Lambert Castle, brought to life by professional reenactor Cynthia Janzen. Janzen's Dolley promises to be every bit as charming as the woman who made the First Lady who she is today. Lambert Castle is a beautifully appointed historic site located on the Garret Mountain Reservation on Valley Road in Paterson. The program begins at 2:00 p.m. Admission is $5 (free for Passaic County Historical Society members). Visit www.lambertcastle.org or call 973-247-0085 for more information. Mars Chocolate of North America will be doing a presentation on chocolate in the 18th century at 5:00 pm, Saturday, at Fort Lee Historic Park. All are welcome, there is no fee to attend. 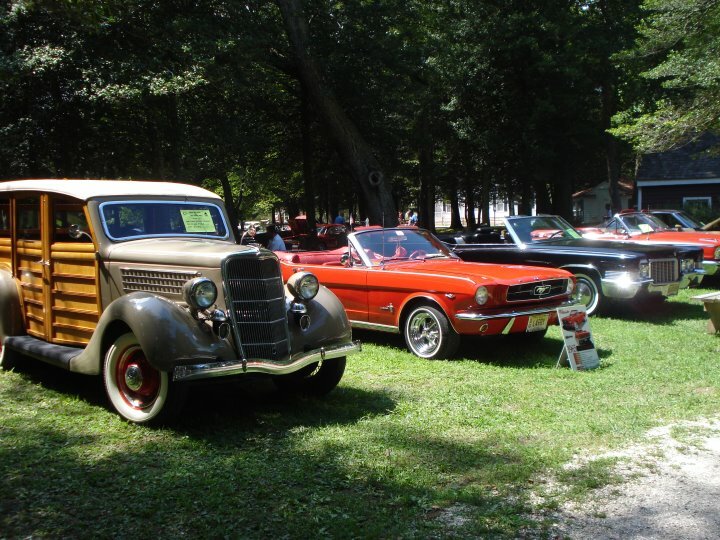 Cruise into Historic Cold Spring Village for the popular Annual Classic and Antique Car Show. The event will be held Saturday and Sunday, and cars will be on display each day from 11:00 am - 3:00 pm. 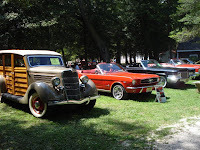 Vintage automobiles and trucks will park among the shaded paths and historic buildings. See beautifully restored and preserved vehicles, from muscle cars to light trucks, from the 1910s to the 1970s. On Saturday, members of the Jersey Cape Region AACA will be showing their antique vehicles, while hotrods and other classics will be presented by KB Productions and the Greater Wildwood Hotel & Motel Association on Sunday. The buildings will be open during regular village hours, from 10 am-4:30 pm, with interpreters in period clothing teaching guests about the crafts, trades and lifestyles of Early America. Historic Cold Spring Village is located on Route 9, three miles north of Victorian Cape May and a mile and a half west of the southern terminus of the Garden State Parkway. Admission during the season is $10 for adults and $8 for children ages 3 to 12. Children under 3 are admitted free. For more information on events, membership, volunteering, or booking private affairs, please call (609) 898-2300, ext. 10, or visit www.hcsv.org. The Walpack Historical Society presents Kevin Wright, speaking on his book, 1609: The Country That Was Never Lost: The 400th Anniversary of Henry Hudson's Visit with North Americans of the Middle Atlantic Coast. Event hosted at the Walpack M.E. Church, Walpack Center. Bring a picnic lunch (noon). Meeting and speaker begins at 1:00 p.m. Questions? Call 973-948-4903. Andover Borough has a very fascinating and interesting historical past. The Andover Museum's historical displays will be changed regularly throughout the year in order to highlight and showcase some of the prominent residents, important events, and significant properties and buildings of the area. In addition to the historic displays, the society also has a nice collection of gift items for sale, including the Andover Borough Afghan, glass ornaments, and note cards, all depicting scenes and buildings of this historic town. The Andover Museum is open to visitors from 1:00 - 4:00 PM on the third Sunday of each month, as well as by appointment. It is located upstairs in the Andover Borough Municipal Building at 137 Main Street/Route 206, Andover Borough, NJ. There is ample parking located behind the building and the museum entrance is on Smith Street. 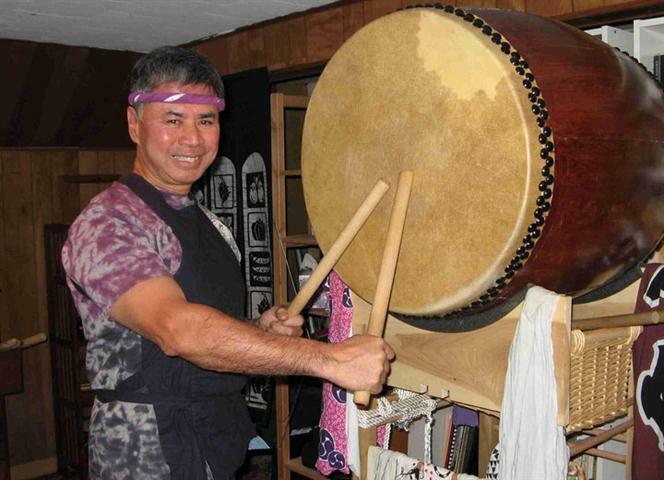 Macculloch Hall Historical Museum is proud to present the very popular Japanese Drums and Ikebana Art program. This presentation proved to be a crowd favorite last year and performers Kenny Chin and Anna Nakada plan on a similarly engaging program in the colorful and elegant gardens of Macculloch Hall. The gardens were restored in the 1950s by the Garden Club of Morristown and are planted for seasonal bloom. In spring, daffodils and tulips are followed by the magnificent wisteria on the back porch. Commodore Matthew Perry, who opened Japan to American trading in the mid-1850s, brought the wisteria planted along the rear porch arbor as a gift circa 1857 to the Miller family who resided at Macculloch Hall. The garden's magnificent wisteria inspired the program schedule for Sunday from 1pm - 4pm, bringing together the Japanese style drumming known as Taiko, performed by Kenny Chin and the beautiful Japanese art form of Ichiyo Ikebana, with Anna Nakada, for an engaging afternoon of music and living art in spectacular surroundings. The program will begin at 1:00 pm. Both Ms. Nakada and Mr. Chin will provide opportunities for the audience to participate and learn about these art forms. Visitors may also tour the variety of plantings in seasonal bloom, and relax on the large lawn during the program. Guests are welcome to bring chairs or blankets. Tickets can be purchased beginning at 1:00 pm on the performance day and will give guests an opportunity to experience Macculloch Hall Historical Museum before heading out to the garden for the concert. The museum is open for tours of the home and galleries from 1pm, with the last house tour leaving at 3pm. The museum will remain open until 4:00 pm, when the performance begins. Admission is Adults $8; Seniors & Students $6; Children 6 - 12 $4. Members and children under 5 are free. Please no dogs during programs in the garden. In the case of inclement weather the performance will be moved indoors. For information, call the Museum weekdays at 973-538-2404 or visit www.maccullochhall.org. Macculloch Hall Historical Museum, 45 Macculloch Ave., Morristown, NJ 07960. The Historic Village at Allaire is proud to present its 17th Annual Antique Rolling Iron Auto Show on Sunday from 8:00 am to 3:00 pm (rain date 08/26). Antique vehicles will be coming in from all over the tri-state area. All vehicles manufactured in 1986 and prior years are eligible to be in the show. On display will be unique, antique vehicles from the area; many of these vehicles you may not see at other shows. Trophies will be awarded to vehicles in many classes including, foreign cars, American cars, custom cars, modified cars,street rods, trucks, modified trucks, and antique motorcycles. There are more than 40 unique trophies, combining People's Choice, the Historic Village at Allaire Guilds, and Director's Choice will be awarded to the winners in each class. This show takes place in the parking lot of Allaire State Park, next to the Pine Creek Railroad. There will be plenty of macadam, with grass and shade to keep the vehicles dust-free, and of course, keep the spectators cool and comfortable. Our food vendors, will be tempting you with hot-dogs, hamburgers, French fries, Italian ice, sodas, funnel cakes and much more. A State parking fee of $5.00 is in effect for spectator cars. Show vehicles are $18, to register the day of the show. Registration is at 8:00 a.m., and trophies will be awarded at 3:00 p.m. This event is not just a car show; it's a day of family fun for the history buff, the car enthusiast, the train fan, and the nature lover. All visitors are encouraged to visit the Historic Village at Allaire. Walk through the buildings, shop at the General Store, and learn about life in the 1830's. This is a terrific outing for the whole family all within beautiful Allaire State Park. There is a picnic area, hiking trails and you can even take a train ride aboard the Pine Creek Railroad. Children will love fishing in the pond and looking at the authentically dressed museum interpreters, as well as visiting the carpenters, and blacksmith shops, where they can see demonstrations of their crafts. The Village tells a story of life in Allaire 176 years ago, a creative learning experience for all to see in the restored 1830's iron manufacturing community. The Historic Village at Allaire is located in Allaire State Park at 4265 Atlantic Ave, in Farmingdale, Monmouth County, NJ. For more information, please contact Historic Village at Allaire during business hours, Monday through Friday, 9 a.m. to 5 p.m. at 732-919-3500 or visit www.allairevillage.org. On Sunday between 10:00 am and 4:00 pm, visit Wheaton Arts & Cultural Center for their 32nd Annual Antique Fire Apparatus Show, Muster and Fire Fighter's Family Day. One of the largest events of its kind, the day will feature more than 80 antique fire trucks from as far away as Virginia and Connecticut. Featured trucks include models dating back to the Revolutionary War era, as well as a Ward LaFrance once used by Trenton Psychiatric Hospital. 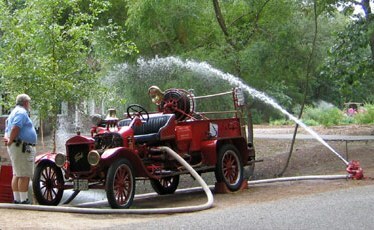 Other antique firefighting apparatus and memorabilia will also be on display. A highlight of the event will be a firefighter competition where children of all ages can witness firsthand how firefighters use their training and skills to battle fires. The friendly competition includes a water barrel fight, where a barrel is suspended on a cable and the two opposing teams try to move it to opposite ends using a high-pressure fire hose, and bucket brigade, where each team is timed as they carry water in buckets to the roof of a small building. Several firefighting demonstrations will also take place, including active pumping displays of fire hoses on numerous fire trucks. The event is hosted by the 100-member Glasstown Antique Fire Brigade, the South Jersey chapter of the Society for the Preservation and Appreciation of Antique Motor Fire Apparatus in America (SPAAMFAA). For Muster Information contact Lee Eggert at 609-296-1025 or visit the Glasstown Antique Fire Brigade web site at www.gafb.net. The event will be held rain or shine. Admission to the show is FREE! To visit WheatonArts: $10 adults, $9 senior adults and $7 for students. Children 5 and under are free. The Asbury Park Historical Society presents Art on the Boardwalk on Sunday in Asbury Park from 10:00 am - 4:00 pm. View oil paintings, acrylics, watercolors, charcoals, pastels, photography and sculpture displayed by local artists in the area. The Montague Association for the Restoration of Community History (MARCH) will open the circa 1790 Foster-Armstrong House and the Nelden-Roberts Stonehouse, at 501 Route 206 for Sunday afternoon tours between 1:00 and 4:00 pm. Both are situated within the Delaware Water Gap National Recreation Area in Montague, NJ and were originally part of the Tocks Island Dam acquisitions. These two sites are utilized by MARCH and portray the area's heritage. The Union Forge Heritage Association (UFHA) will open the Solitude House Museum for tours every Sunday between 2:00 and 4:00 pm. Visit the home that housed the presidents of the Taylor Steel and Iron Works. While visiting the estate, see the 1742 slave/servant quarters, the historic 1908 Lake Solitude Dam, 1742 Union Iron Works ruins and take a walk on the Taylor Steelworkers Historical Greenway, a 7 mile trail that takes visitors through nature and history in High Bridge. 7 River Road, High Bridge, NJ. View the exhibit "Lights! Camera! Action! History of Film: 1890-1960" at the 1741 Cornelius Low House Museum in Piscataway. The museum is open Sunday afternoons from 1:00 - 4:00 pm. The exhibit will run through December 31, 2012.